It's been a great quilting season so far this year. From the looks of the weather forecast, it's not ending anytime soon. There's still some time to stock up on solids. Our solids will be on sale until January 31st. Starting Monday, January 27th, you can pick up your swatches of fabric for the next Fabric Challenge Project! The deadline for swatches pick up will be Wednesday, February 5th. Projects will be due by Saturday, March 15th. Judging will be Monday, March 17-22, 2014. Votes will be tallied on March 24th. For our newbies, the Fabric Challenge Project is where you stop in the Shop, we will give you 2 random swatches of fabric. Your challenge is to make a wall hanging no smaller than 24"x24", no larger than 30"x30" using the 2 swatches. You may add up to 4 more fabrics to your FCP. This is a good way to get yourself to "think outside your box". All judging is done by popular vote & prizes are given out to the top 3 winners. This is a free contest. Stop in & pick your swatches this coming week! Now, your probably wondering why there's a photo of 4 cat toy mice. Starting Monday, January 27th, we will be hiding these mice around the Shop. If you find a mouse, you will receive 35% OFF the highest priced product you purchase. We call it Mouse Capades. Please note, the mice will not be "buried" anywhere. So, you will not have to "dig" for the mice. If you're thinking that I've finally lost my mind with this sale, your probably right. But, at least, I'm enjoying my insanity. This is our new Northcott Fabrics Artisan Spirit Shimmer Collection. We will be getting about 9 new bolts every month from January through July. This collection is subtle marbles with gold or silver metallics marbling. Our first shipment arrived on Thursday, they all have the gold marbling in them. Our sales rep tells us we are the only ones within about 50-100 mile radius (that he knows of) carrying this collection. The fabrics we have received, as you can see, are beautiful. Come in and see this new collection. We're sure you're going to like it! Mom is back in the Shop about every other day or so. We have a recliner installed in the back for her to put her ankle up & rest. I think she really missed coming into the Shop. The walls have been closing in on her at home. Finding as many excuses as possible to get my brother or I to take her out. Mom is going to start doing some classes next month. Private classes are once again available. She will schedule her days in the Shop with any classes you would like to take. Some of the classes she's planning to teach in 2014 are Stack-N-Wack (a book will be included in this class), paper piecing, drafting your own block, & beginning quilting just to name a few. If there is a particular class you would like to see done or one you would like to teach, let us know. We hope you enjoyed our 12 days of January sale last month. We enjoyed randomly picking out something to put on sale the night before. We didn't even know what we were going to put on sale until about 6 or 7 the night before. It was a tough decision some evenings. Keep an eye out, who knows, we may get bored and decide to just throw something on sale & send out an email about it. 1. Pick up your swatches for the FCP. 2. Keep an eye out for mice in the Shop. 3. 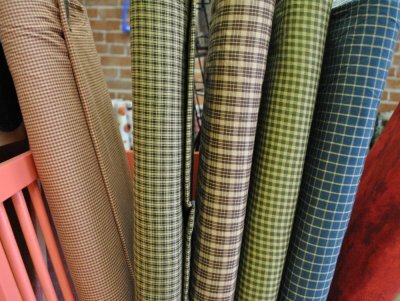 Check out our new fabrics. They usually come in every week or so. Stay Warm Quilters & Keep On Quilting.